The National Director for Leadership Advancement for Best Friends Animal Society, Tawny Hammond has more than 30 years of experience in the public service arena, creating and implementing programs and services for people and their pets, working effectively with appointed and elected officials, creating and leading teams focused on professional excellence and lifesaving best practices. 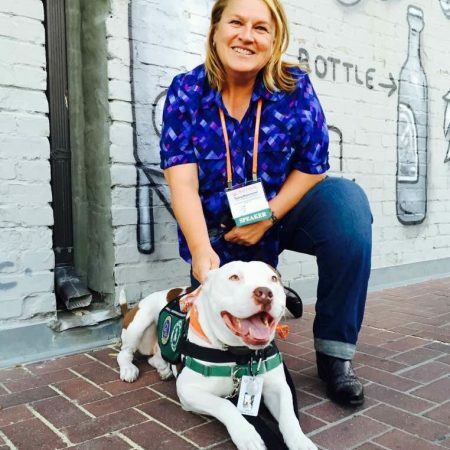 Tawny currently leads Best Friends’ leadership advancement initiatives with a focus on strengthening existing leader’s skill sets for the goal of ending the killing of shelter pets in their communities. She hopes to add an additional focus to the program which will consist of developing programs to assist seasoned leadership from other fields and disciplines interested in making the transition into animal welfare and services leadership. Tawny has a proven track record of success, serving for more than 25 years in municipal government in Fairfax County, Virginia. She brought the Fairfax County Animal Shelter to a 90 percent live release rate in less than two years by removing breed restrictions, growing a robust volunteer program, establishing a cutting-edge foster program for the dogs losing their lives, strengthening community cat programs, and establishing the animal shelter as a community center for residents of Fairfax. Tawny is also the former chief of animal services for the city of Austin, Texas. Under Tawny’s leadership, Austin and Travis County, Texas, reached a new milestone in 2017, achieving live outcomes for 98 percent of the more than 17,000 animals who came through the doors. Tawny is devoted to ending the killing of pets in shelters and believes that how we treat pets and their people is connected to social justice, community wellness and our compassion as a society. Attendees will learn about the experiences of people who successfully broached 80% and beyond save rates. Join us for this panel discussion and discover how to make decisions that affect the live outcomes on a daily basis.